Reportedly 317,510 ballots in the county were cast out of 1.5 million registered voters according to Secretary of State Debra Brown’s office. Michael Vu from Registrar of Voters said that there are about 98,000 absentee and provisional ballots to be counted, which could push the county’s poor turnout figure to 27%. 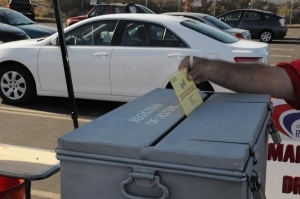 Some provisional ballots could still be disqualified says Vu. There’s been many predictions of what the voter turnout would look like. While some fell flat and others too much, the overall predictions were low entirely. Vu predicted a 35% turnout, while the National University System Institute for Policy Research predicted 18-23%, because “the low voter fatigue and low profile contests”. Polls closed at 8pm, but most San Diego County have decided to cast their ballot via email rather than going to a polling station. Over the past 18 months, San Diegans have voted for a new mayor, a state senator, a city councilwoman, and an assemblywoman-mostly in special elections. The mayor and council races each resulted in two votes, a primary election and a runoff. If you do not vote in an election your citizenship should be put on hold till you vote in the next election. Or Raise the voting age to 35.